I don't really find anything on the new dashboard of profile that works BETTER now to be honest. Top menu missing with "Lists" and all the other quick links. Now I need to scroll down even on my large 1920*1200 display. Hello "cacher" part: This now has less info than before using WAY more space on the screen with a huge and completely unneeded gray tile on top of the avatar. And instead of the "View profile" button I'd simply like to get back the stats bar. It was showing some quick info! Different menu items on the left, all grey on white and the single topics too close in style to the menu items itself. Trackable inventory is missing, just exists as a further link! Recently viewed way too prominent, way too big, way too many. And waste of space anyways. Once cache now needs double the space than before. I can't suit 30" display on my desk And I don't need to see these caches. I didn't mind having them on the old dashboard as they didn't need too much space but now!? Recent logs: I'm not a stalker so I don't want to see these friend logs at all. They don't help me especially as quite some of my geocaching friends live so far away from me that I hardly ever will visit one of these caches. I only want to see MY logs and with at least all the info that has been on the old dashboard. I would even add more info and not remove some. I would like to directly see the GC code, too And I still also want to see the trackable logs as this was what I was using most on the dashboard. In total there's not a single reason why I would prefer the new version as the old one works way better for me! The new profile is wasting so much space for nothing! My wide screen will just be used for about 40% of its width. The remains is either white or contains adds (Ok, understand, that these will pay the site, too). The interesting info is been showed in the lower 40% of my 1920*1200 screen. That makes it even worse for people with a lower resolution. Worst of all is that my PROFILE first seemed to be gone and now I've found it as "About". This what I want to see if I access my profile and not the Geocaches. Again: I don't like the new version as it again is a backdraw for my needs and usage model. 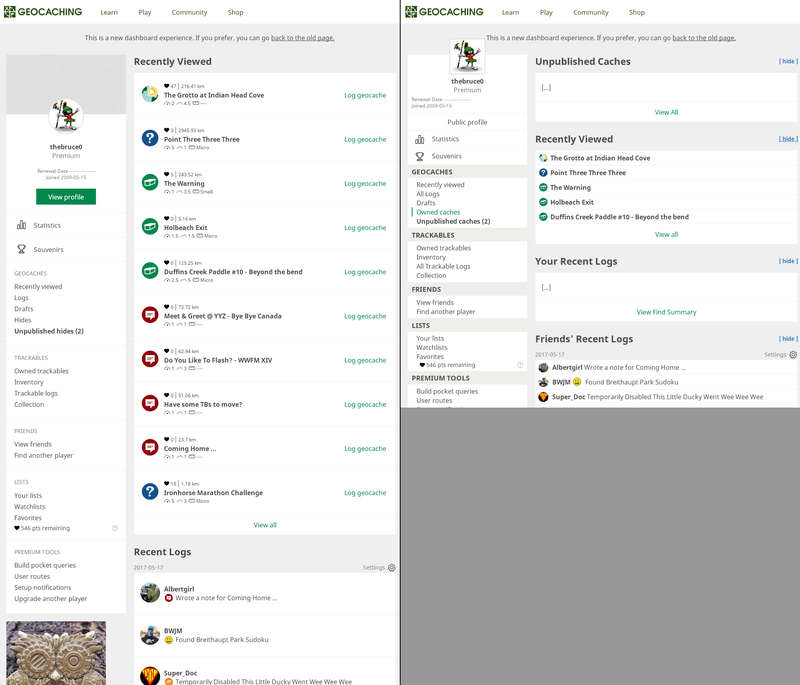 Image is a composite of the old dashboard and the new, illustrating the loss of info for hiders about the status of their unpublished caches. Upper left from NEW - Unpublished hides (5) - this does NOT change when those caches are submitted for review. Right side of image, the list of caches displayed if you click on "Unpublished hides" - no cache type, no indication of disabled/enabled, this list does NOT change if a cache is Submitted for Review. Cache title is dark gray and nothing indicates that it's a link to the listing. As both a prolific hider and a reviewer, this loss of information about the status of unpublished caches is a really Bad Thing. I searched for an alternative to the new Dashboard, for the moment when GS decides to force the use of it - but sadly I came out with nothing useful. There is an Extension to Chrome, "Stylish" that allowes to change at least some part of the style - this could address the huge waste of space. Maybe a Script for Greasemonkey could turn the page into something better. I just tried to write a script in PHP, for "remote navigation", but was only able to load static content. It would be possible to create something that's really cool with API-access , but sadly that's no option as GS points out "At the current time, we are no longer accepting new requests for public API access." It's really depressing to see how geocaching.com evolves - I dislike so many of the recent "improvements" (most time not the idea itself but the implementation) and lost all hope for real improvements to be made. Recently viewed takes up way too much space, and I don't want to see my friends logs. I'm going to have to unfriend them if this isn't changed. Why can I turn off my logs in their dashboards, but I can't block theirs? This makes no sense to me at all. Totally agree with the person above who said I don't need to be reminded of how many retired friends I have who can cache whenever they want while I'm at work. Let me turn off seeing my friends' logs. I would prefer that you continue to default to the "About" (formerly known as "Profile") page. Cachers go to a lot of trouble to make that part of their profile their own and it should be the first thing we see. Currently the default is a bunch of [iMHO] irrelevant numbers. Yawn. On the plus side, nothing has broken or otherwise needs touching up in my custom HTML. Good job on keeping the CSS etc. consistent. Also with the "Unpublished Hides" list, there is no icon showing what the cache type is. It would be very beneficial to be able to see the cache type here. And also less white space would be great. Hello, thank you for upgrade to scalable, modern designs, thumbs up for initiative. I think it is a good start, but I hope our feedback can be taken and implemented. New dashboard is really terrible. There is too much empty space, fonts are too big, icons are too big, waste of empty space between lines and items. What was before in 1 screen, now I have to scroll 3 screens. I understand that developers have to be creative and have to report some work, but please not this way. Please don't make it unusable ! Please do not destroy the geocaching web pages. I often looked at the last 15 logs as there is no log preview any more when logging in that confined box, so this was a good and above all very quick loading simple place to see at one glance whether my last logs are like intended and the story in right order, without having to visit each cache page separately. Recent logs shows me one single day. And for logs of my friends not the date the logs are for. Only one of my recent logs is visible as only one day is shown. Please have MY recent logs on another place and not mixed with the logs of my friends and let me choose whether I want to see their logs for every friend separate if they don't decide to hide their logs anyway. And make it collapsible, please, but don't let me scroll for every single line to be added like currently at the pocketquery page where some lines need up to a second when everything else is fast. Can the the cache type icon be shown instead or at least in addition to the yellow smiley? And if so much space is already wasted due to the profile pics and the white, why not add infomation to these entries like D/T? On my mobile, nothing loads for Recently Viewed and Recent Logs, only a spinning circle for minutes. At least if I click on Recently viewed on the left side, it takes me to a perfectly formatted page, hope that stays. To my taste much valuable space is wasted, on mobile even more with that large header and too much useful information and links removed. Seeing the grey popup in the favorte point section: A lot of people have no explanation why (no found it on own caches, no cache logged twice as found, no lapse in premium membership) the next favorite point isn't awared when one would expect it. For example with 3680 unique found it I would think that 1 (one favorite point for being PM when favorite points were introduced) + 3680/10 equals 369. The popup tells me that I have 367 favorite points in total and need 8 more finds for the next favorite point. Not that I need them, but what is the algorithm/logic behind this? Is the explanation "Only your first Found it log to a cache that you don't own is considered in your Favorite Point total." to be taken literally, e.g. when two two identical found it logs were sent due to bad connection or whatever and you delete the first, 1/10 Favorite point is gone? Or if you delete a Found it for some reason (wrong GCcode, false order) is that 1/10 Favorite point gone forever because when logging that cache later, the found it isn't considered to be the first? Does it mean, no 1/10 Favorite Point if someone changes a note to a Found it? Or is it meant like explained elsewhere "One Favorite point just for being a Premium Member. One Favorite point for every 10 caches they find. (Duplicate finds and finds on your owned caches are also not included.)" at the knowledge base? Indeed - I appreciated step forward into modern and scalable design. However I understand true value of "dashboard" differently - it should provide user quick overview of tools that we need to play this game. Again, I hate to read and write long texts, it will be more efficient to reflect it visually. Thank you for opportunity to send feedback. I have been touched by his noodly appendage. On the recently Viewed list the cache name is a link to the cache page; there's also a link to the right saying "Log geocache", I would expect that clicking it would take me straight to the log page, but it also goes to the cache page - what's the point of having two links which do exactly the same. I quite like the new profile page. I prefer NOT to have the About info as the landing tab, as I've seen many profiles over the years with so much stuff on them that the profile can take an age to load, so it's better that it's not thrown up by default. However the avatar and banner it sits on at the top is too large, when clicking on someone's profile more than the top third of the page has NO information whatsoever. Bullies are beneath contempt . All of the actual useful information for anyone who is more than a casual cacher has been crowded into the left hand side of the screen, whilst the larger right hand portion of the screen holds (and emphasises) information which is of minor or no importance: the 'recently viewed' section has far too much white space, too big an icon, all I need is the cache name with a link, I know the D/T etc, after all, I recently viewed it ... I assume this is another sop to the 'phone based tiny screen users, it is not good on a proper screen. The recent logs section I find ... disturbing. If I want to see what my actual caching friends have done recently (and I seldom do) I can look via their profile, the caching 'acquaintances' who asked to be friends (and it seemed churlish to turn them down as at the time it was a harmless addition to a fairly pointless page), well I don't actually want to know what caches they log. Neither do I want to have my own activity casually watched. So, I went straight to the gear icon hoping to switch 'recent logs' off, but there is no such choice, so I've made do with "Block friend requests from other geocachers" and DONT "Show my recent logs on my friends' activity feeds". If there is no facility for getting rid of the feed entirely,and the old page goes, I shall be removing all of my friends. A far more sensible layout would be each sub heading on the left being on a horizontal top row menu with drop down lists for each option : oh hang on, thats the old dashboard . Being a cache setter, I like having the constant reminder at the top of the page that I have these as yet not submitted caches in the system awaiting my attention : if as Isonzo Karst has mentioned, the new page will not show those caches' status as submitted but not yet reviewed, or reviewed and locked until a requested publication date etc, that will be a major problem for me. The profile page is OK, except for the blown up icon : as I recall there was a severe limit on icon size when I made mine 7 years ago, and it looks fine at the size it was made to be, but terrible blown up on the new profile. You could give us the option to default to our icon or upload a different picture for our profile, or if acceptable icon parameters have changed, and we can now upload higher resolution and larger images which willlook OK at that size, for goodness sake, tell us so! I'd like sortable / hideable tabs there, or at the very least to bring 'about' to the front, as it is the only page I get to customise and present to viewers, therefore the one which is most important to me personally. And finally, please, please don't use the redundant adjective 'experience' as in 'new dashboard experience', it's not an experience , it's just a webpage. Seeing everything from toothpaste to sofas advertised as "A new <something> experience!" makes old cynics like me immediately label it as vacuous trendy marketing hype for something which has nothing substantial or worthy to recommend it. Please try not to waste more than one line on each recently viewed cache. It's nice that you're trying to give me more information, but I don't want it if it quadruples the amount of vertical real estate each cache takes up. And I think "D1.5/T2 Other" would be much, much neater than "[indecipherable icon]1.5[weird line that I think is supposed to be a mountain]2[is that supposed to be a ruler?]----". Don't be so enchanted with icons that you forget that while "D1.5" is not necessarily obvious, it does have meaning while "[random icon]1.5" is no better than "1.5". I can learn "D" means "difficulty" more easily than I can learn that whatever that icon is supposed to be means "difficulty". To me, the most important part of the page was the list of my logs. It's gone! It's been replaced by a list of a whole bunch of logs, most of which I don't care about. (And I actually care about most of my friends: I can't imagine what people think about it who gather geocaching friends like facebook friends.) Sure, I agree, seeing the list of my friends logs is an interesting idea, but it's not what I come to my "dashboard" for, so please put your cool new idea somewhere else. I come to my dashboard to see my logs. I also use the links along the top all the time. Gone. I assume I'll find most of them in that column that goes off into infinity down the left side of the screen, but I want them at the top where I don't have to scroll. Another link I use all the time is the link to the map. Even as inconvenient as it is on the old page, I use it almost daily. When that missing link came up in the discussion of the mockup, I thought I understood it was just somewhere on the page other than where one would expect it, but I can't find it. It's a little hard to tell so soon, but I'm guessing that once I get used to it, I'll prefer the overall layout, like moving the claptrap from the right side to the left side and reorganizing it. Now, I have to wait till it populates (it's yet to fully populate for me in my iPad), then scroll down to get to the link I want to use. I finally had time (and courage) to see new design. And I have mixed feelings. I quite like new profile. Same functions-new look. OK, I can used to it. But dashboard is totally messed up. If you just upraded it into new look, it would be OK. As here somebody wrote, I am not stalker. I don't need to know, what are my friends doing. I will aks or write them on my own if I want. Don't make geocaching into some bizzare facebook look! My page should show info about me not about my friend. Hello! Thank you to everyone who has provided such in depth feedback so far. We will be looking through everything very closely and making adjustments, but I just wanted to quickly address a couple of items that jumped out at me. Performance of Recent Logs: this is a known issue and we are actively working on making it faster. We were trying to find a balance between making the recent logs available quickly and highly optimizing it. Unfortunately, for some of you that balance tipped more on the side of watching a loading icon for eternity. It will get faster though. Filtering Recent Logs: Our intention is to provide more flexibility on what is displayed on Recent Logs. Once again there was a balance between trying to make it available and adding all the bells and whistles. We didn't want to add lots of filtering options if the community only wants on/off. So yes, lets discuss how this can be more functional long term without making it overly complex. 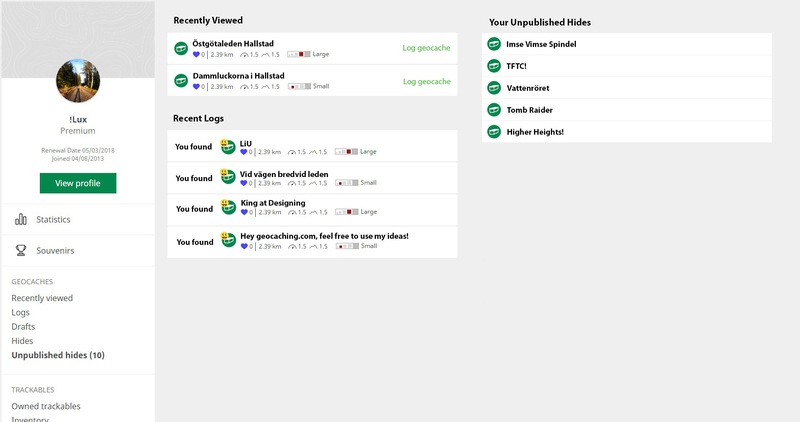 Recently Viewed is HUGE: We will be reducing the number of recently viewed geocaches to 5 in the short term. There are also discussions about reducing some of the padding so each item isn't quite so large and long term making the entire section collapsible. More to come! Thank you for your feedback! Atm its a ton of wasted space and lacks alot of info and so on and so on. If ive ever will consider using it it has to be more compact and use more information. Its just a fast fix for the basic stuff. It should still contain alot more info in just one screen. You should not have to scroll 10 pages to get to everything. If it was a mix of old and new id use it no doubt, just like the image above. But atm its terrible and ill use the old design over the new any day! If they ever stop and display useful information I'll be sure to report back my impressions. Same here. They're promising "faster" but at over 10 minutes of whirling, it 5 minutes really any better. I stopped waiting for the whirling to end after five minutes. Although I suppose watching the circles whirl could be a new hobby. After watching the endless whirling for awhile longer I decided to go to my iPhone and see if things were any better. There is no whirling because the mobile version does not show the information on one page. I am not a fan of a lot of the mobile webpages, and prefer when there is an option to view the full desktop - which you don't offer unless I choose the old version. The old web page is handier because I can see the page and click on what I am usually wanting to see (recent views or recent logs) without scrolling down to the links and opening up a separate page. After doing that I went back to check on the dashboard on my other device.. Still whirling, so at least that is consistent. In an effort to not offend the moderator, I will stick to the facts. The Dashboard does not load, just sits and spins. I don't need to see every cache log all the way back to the beginning of time. 30 days is enough, then add a "MORE" button. Do the same with TB logs. When in doubt -- bushwhack! The new dashboard view is clearly designed for optimal viewing on a phone or tablet held vertically. Big waste of space on a laptop. I would not mind seeing my logs separated from those of my friends who do not opt out. I also agree that I'd like the ability to hide some friends' activity from my feed. Ugh. I strongly dislike the new dashboard. Way too much white space. I don't need to see all the recent logs from friends. Missing the Quick View across the top. Missing my own recent logs. Stop fixing things that aren't broken. The new dashboard view is clearly designed for optimal viewing on a phone or tablet held vertically. Reading this, I tried it on my 7" tablet held vertically. The rightmost 45% of the screen is a column of grey containing nothing. I'd like to add my thoughts about the new dashboard and profile pages. 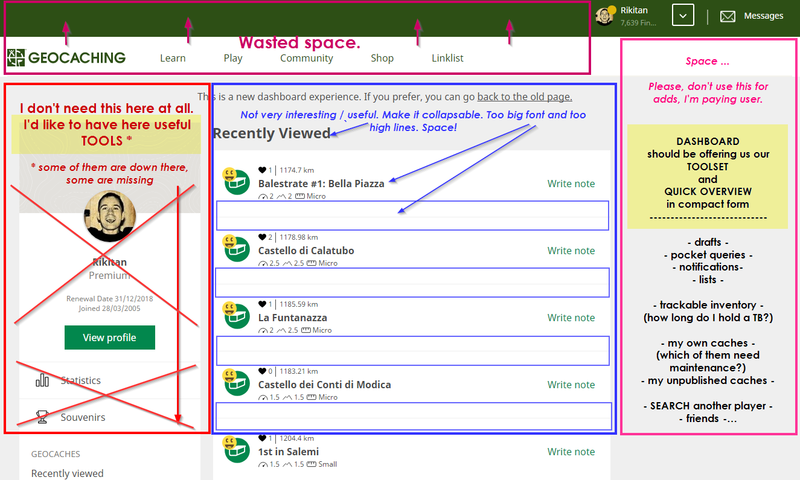 I think the improvements made here were long needed and improve upon the visual aesthetics and usability of the site. Here are some ideas for improving it further. 1. Public profile tabs still point to separate pages. This "reloading" of the entire page is clunky and slow. The layout with tabs is perfect, but it could function similar to the tabs on the statistics page where the content area changes, but the entire page isn't loaded over and over again. 3. Perhaps split the recent logs section into two: one for "your logs" and one for "Friends' Activity." 4. The dashboard really ought to be set up as widgets, where users can drag each section to display it in the order that he/she wants. Plus, users can pick and choose which widgets to display on the dashboard. -- Some information from statistics could be turned into widgets. 6. Finally, in combination with some of the suggestions above, the information could be displayed in two or more columns, again making more use of screen space and reducing the need to scroll down a super long page. 2. Removal of the banner image (even if I upload one, eventually, I don't care to see it load every time on my personal dashboard) and re-squared the profile thumbnail. 10. Central: "Recent Logs" renamed more descriptively to "Friends' Recent Logs"
Additionally, testing responsiveness I had to make code adjustments so that item displays at thinner browser widths were still friendly. That is, text wrapping, image alignments, block formatting, etc. Now obviously I haven't tested my styling changes on all the platforms/environments GS needs to verify, but visually I, at least, find these adjustments much more appealing for the desktop experience. !Lux also added the horizontal toolbar at the top which would be another great addition. Also, on first load, if a section is hidden, don't auto-populate. That takes up time. Ideally, a section should populate when it's shown for the first time, and if there's a 'refresh' button. Minimize data calls, minimize bandwidth use, minimize synchronous extensive browser scripting. I just noticed that the email link is a real mailto:... link. Nice! Not nice, this shows my e-mail address to everyone! Please remove this function. Account Settings/ email address allows you to hide the real address so that communication is via GS. Maybe you have it checked to show? Still seems to work for me. If you have chosen to hide your email address, then the new profile page works the same as before. The email link goes to the geocaching.com form that sends email without exposing your email address. But if you don't choose to hide your email address, then the new profile page uses a mailto link. The old profile page shows your email address, but the link actually goes to the geocaching.com form. What I really like is that the "about" tab comes last and is not open by default. So one would not see all the annoying statistics and banners of the self-promoters at first view. To me, this is an argument for separate "About" and "Personal Statistics" tabs. The default could be the "About" tab, and the "annoying statistics and banners of the self-promoters" could live in the "Personal Statistics" tab, available to those who are interested, but without cluttering up the general information in the "About" tab. As for the stalker thing someone has mentioned: I am not a stalker as well but me and my friends often visit the Friends page and check out others' new finds (GClh II is very helpful in this) as we like to talk about where we were, what we experienced there, watch the pics etc. The feed will make it much easier for us. Wow, if the feed items only indicated somehow there are images attached to them, that would be something! People who don't want to share their activity with their friends can easily switch it off. One click is all it takes. No need to talk about stalking anymore. I stand corrected. So this is good for phone, period. In general I like it, but could be page with th unpublished caches be a bit less white? 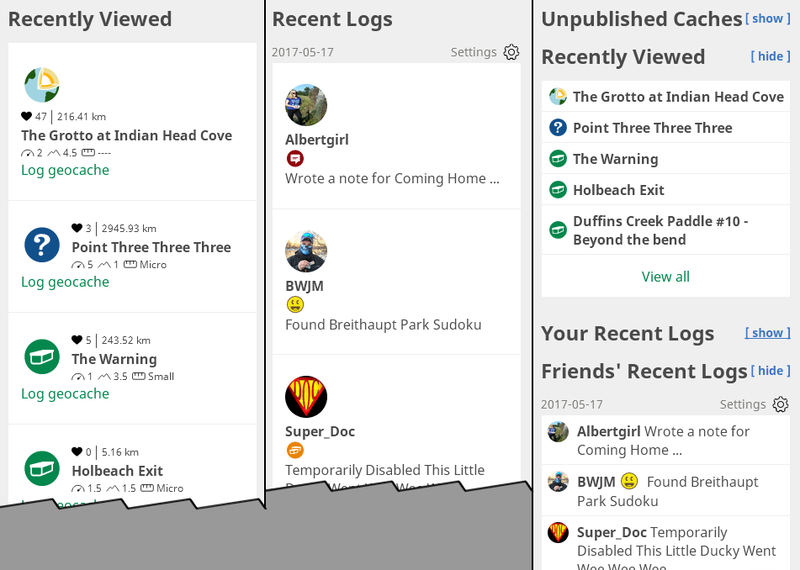 For example you could put the Geocache Type, the last Reviewer Note or status on it. Thanks anyway for the new page! A couple of releases have been deployed this morning to improve the performance of the Recent Logs feed, reduce the number of items in Recently Viewed to 5 and reduce the padding around everything in the main column. This will be the first of many additive changes so keep providing feedback! If you are having an issue with either the Recently Viewed or Recent Logs feeds please let us know what OS and browser(+version) you are using so we can look closer. If your content has not loaded after several seconds then it likely encountered an error. We will be adding filtering to the Recent Logs feed to allow people to disable logs on their own profiles from other players. 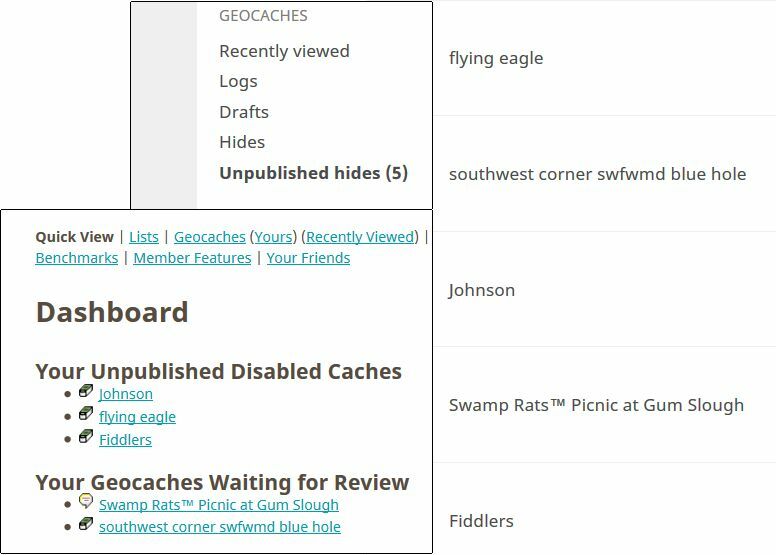 There are more plans for the unpublished geocache listings on both the Dashboard and the "view all" page. Are these features lost on the "Your Geocaching Details" page? 1) Box on the left that states "View geocaches you own or have found." 2) Calendar on the left that you could scroll through to find logs on certain days. This is great. I strongly recommend to use your advices. I remembered one more thing. There is missing one link that I use in my profile the most - Advanced search. I would realy love to keep it. Jako jo, v zásadě souhlasím. Taky se občas podívám, co kamarádi dělali (dělají), ale ať je to aspoň schované, a ne smíchané s mými logy. Yeah, I generally agree in that point. I sometimes look at my friends activity, but don't mix it with my recent logs. 1) I don't want to see friend's logs on this page. Give me a way to turn it off. 2) I don't want to see recently viewed caches on this page. Give me a way to turn it off. 3) I DO want to see MY logs for the past 30 days. This is what I use most on this page. Please let me do it. 4) There is way too much white space on the page, requiring much scrolling to see what I want. The compact listing on the old page was good. I would love to know how many users actually make frequent use of the Dashboard page on a smartphone, and not the desktop. I can't imagine that being a ratio anywhere close to usable as reason to optimize it for mobile... But I'm just guessing here. I also just noticed that trackables I visited to a cache today are showing up in the Recent Logs section. I'm not sure I like this feature. It is not something I'm interested in seeing. I would be okay with trackable drop and retrieve logs, but don't think it's necessary to have visit logs show up. Currently, does this show up just for myself? Or does it show for friends as well? I know there are some people who visit a dozen or more trackables at each cache they visit. I definitely don't want all of these visit logs cluttering up the Recent Logs section. The more compact (less air-puffed) layout in the screenshot by thebruce0 above is brilliant. I say, borrow that layout and give him free premium membership for life. I tinkered a bit with profile photos, and found a few glitches. I assume that part is still in flux. I can't figure out how to select a previously-uploaded profile image. It just keeps sending me back to a page I was just at. Uploaded a new image, something of decent size, 2:3 aspect ratio. On the dashboard it'd been rounded (hmm), and also compressed horizontally (ugly). I right-clicked View Image on that picture, ah, there's a version with the proper aspect ratio. It's bigger than 68 square, but smaller than what I uploaded. Will that eventually be what's shown there? Because I couldn't figure out how to select a previously-uploaded image, I re-uploaded the original. The one I uploaded in bullet point #2 doesn't show up in the list of previous images. Also, in Account Settings / Profile Information, I noticed that when I hovered over the existing avatar image, an "X" appeared in the top-right corner. I wondered what'd happen if I clicked somewhere else on that image. Maybe it's the secret door to choosing an existing image maybe? I'll tell you what happened: it deleted the image. Even though I didn't click the "X". Luckily there was still an "out": don't click Save. I tested and uploaded a new profile pic which is 815x815 to see what resizes are made and how they're used. Also it seems that cachers can choose not to share their activity with friends, but I can't see a way for me to not see their activity if they have chosen to share it. Please give me the control over what I see rather than leaving it in the hands of others. If this can't be fixed I will be "unfriending" all my friends. We are planning on doing this as well. We do not do Facebook and we do not want a Facebook-like experience on Geocaching.com. I rarely use a computer to access this site and frequently rely on my iPhone. I don't like the way that the new dashboard displays things on the phone - i prefer a desktop view to the mobile display. The dashboard does not work as intended on my iPad - endless whirling circles for recent views and logs. I finally looked at the page on a computer and the display worked there - although it was somewhat slow to load the whirling circles stopped. I'm puzzled. I see the reverse: in the old page, visits are now and have always showed up in the "your logs" section, but on the new page's "recent logs" section, I don't see them. In portrait mode on my phone it makes no attempt to load the new 'Recently viewed' or 'Recent Logs' panels. I can get at both those items from the menu I see, but both load far more data than is appropriate. If I'm using my phone and I want to look at recent logs it's because there's something I want to use in the field. I need, perhaps, only the last 20 logs. I don't need to use mobile data downloading 1500+ logs I won't look at. You might argue that the app is more appropriate to use on my phone, but that is still beset with limitations of its own (that this week's release still fails to fix) that it's not credible as a primary source of information. Having loaded the new dashboard on my desktop computer I can see the real limitations of the new layout. There is so much wasted space! Most of the screen is initially taken up with the 'Recently Viewed' list which is at least 40% bigger than it needs be because the cache data is split between lines above and below the cache name. At the very least move the data all together below the name and shrink the lines accordingly. Lastly, logging travel bugs with long names causes the entire text block for the dashboard log entry to appear below the avatar image instead of beside it. You guessed it - even more wasted space! Thanks for the update. It already looks better just by reducing the number of recently-viewed and reducing the padding. I'd say the padding could be reduced even further by a bit. For those who missed it elsewhere, TPTB have decided to try a different style of development for the new dashboard and profile pages. The new versions of these pages will remain as opt-in through the summer while they incrementally add and change things, so you can choose to change back and forth. You aren't being forced to use the new pages yet. What you're seeing now is basically just a first draft (or rather a second draft after today's updates), so don't be too quick to pass final judgement yet. Rather than just calling it "terrible", make sure you provide constructive feedback about what you feel doesn't work, as well as what suggestions you can make to improve it. As has already been demonstrated, they WILL listen to and act on our feedback. By the time we're all done with this process, I expect we'll have a very useful pair of pages that will meet the needs of most members. One of the problems with deferred loading is to understand what causes the user experience bottleneck. Is it the request for data and waiting for the server to finish sending, or is the active rendering by the browser of the returned data to the user, which hangs the browser? For quick loading of the Dashboard page, ideally there'd be no deferred automatic content loading, primarily because if its frame is loaded, it can be jarring if the content does additional size adjustments to fit the new display once you have already found other parts of the page to interact with. B] Content blocks for which you can request content to be loaded manually, when you desire. For the Dashboard, ideally, those long lists of logs being retrieved as JSON data should not be loaded automatically if the data is complex to render. Let us choose to view them if they aren't loaded in the top page HTML itself.